On the way to Seiryo-ji Temple in Arashiyama, you can find a restaurant called Soup Dining PanBoo, that takes great in choosing the ingredients it uses, only using organic vegetables and eggs from Miyama (the eggs are famous!) in northern Kyoto. So here you can eat healthily with a good conscience. The soups here are the main actor, as with some of them, you get five different seasonings which you can use to change the taste. They also offer vegan food, and it’s delicious! But not only delicious, but it’s also macrobiotic, so you get brown rice and oats, and the food is made in accordance with the twin principles of Yin and Yang. This type of food is sure to help you live a long and healthy life! Inside the restaurant, they use a lot of bamboo, so the atmosphere is warm and relaxing. As most restaurants in Arashiyama are only open until 6 pm, it’s very nice that this restaurant is open until later, although only if you remember to make a reservation. So if you want to spend your night in Arashiyama eating something nice, give PanBoo a call! 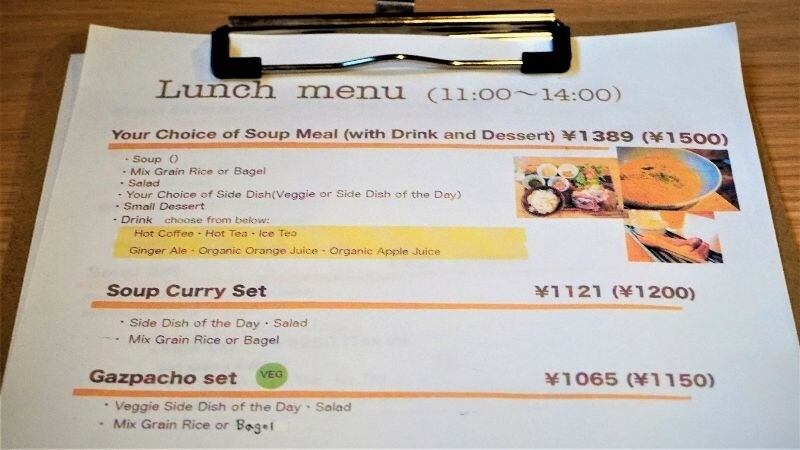 This menu is super popular, and you get to choose a soup, you get a salad, brown rice or a bagel, main (vegan or fish/meat), mini-dessert, and a drink. The soup in the picture is curry, and it’s served with coconut, almond slices, toasted garlic slices, croutons, and sesame salt, which you can put into the soup as toppings if you wish to change the taste. The bagel contains tapioca in it, and it’s nice and chewy. The rich cheesecake and apple juice are a very nice dessert combination, and all in all, this meal leaves you feeling very satisfied. Homemade miso soup, crispy deep fried kuruma-fu, salad, brown rice, sesame salt, and Japanese dried plum are what you get with this macrobiotic lunch set. The texture of the kuruma-fu is very nice, it’s really crispy! The miso soup is a bit more fragrant than most other restaurants, and it makes you feel warm from the inside. Put some dried plum and sesame salt on the brown rice to make it even more delicious. *The main changes weekly. Made using eggs from Miyama, the chiffon cake is fluffy and moist, and because it’s made by the chef who has studied in a pastry school, the taste of the egg is strong, and when you add a bit of ice cream to it, it makes the taste even better. Red bean zenzai is a classic Japanese dessert, and it’s like a hot red bean soup. Here you have matcha ice cream on top of the hot zenzai, so you get the sweetness of ice cream, the bitterness of matcha, and they all go really nicely with the sweetness of red beans. This is a great dessert choice here! Their menu is in English, so ordering is easy. 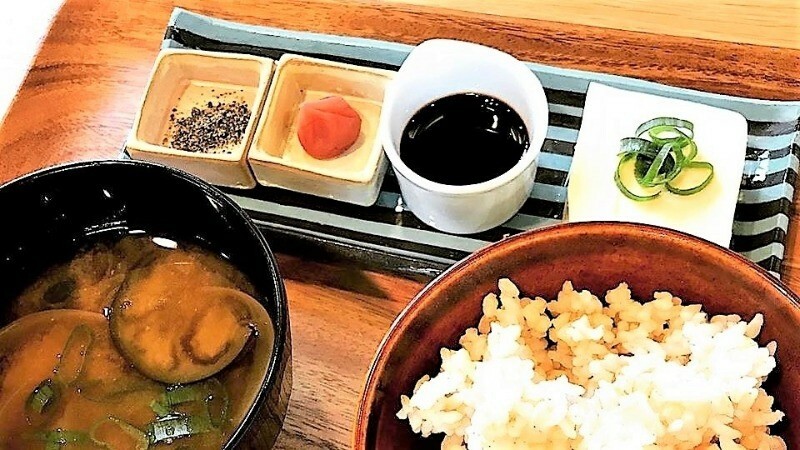 Breakfast is served from 9 am to 11 am, and they have three options: macrobiotic breakfast for ￥540, bagel breakfast for the same amount of yen, and an Asian ginseng chicken soup breakfast for ￥680. The prices include taxes. I eat mostly vegetarian food, so for me it was really nice to get to eat the delicious dishes here! I especially liked the soups, you get five different seasonings with them, so I was stunned by their deliciousness. As the chef here has graduated from a pastry school, the cakes are also really delicious! Unlike many other restaurants in Arashiyama, this place serves something for everyone: carnivores, vegetarians, and vegans. This restaurant is a sure choice in Arashiyama! A 10-minute walk from Randen Arashiyama Station. Close to the sightseeing spot Seiryo-ji Temple, and not too far from Randen Arashiyama Station, this restaurant is conveniently located.